East Bay Innovations provides personalized support to enable individuals with disabilities to live in their homes, to work jobs of their choosing and to participate in all aspects of the community. Supported Living serves clients with developmental disabilities who have up to 24 hour daily support needs the chance to be able to live independently in their own homes. Our staff is assists clients with all their basic living activities needed to safely live on their own, including providing personal care and overnight support. Independent Living serves clients with developmental disabilities who wish to live on their own but do not need daily support. Our staff provide assistance to learn basic living skills, including grocery shopping, planning a meal, making a budget, balancing a checkbook, addressing chronic health issues, and dealing with social security and other disability resources and benefits. Employment Services assists clients with developmental disabilities to obtain and maintain employment. Our staff assist clients to learn about career options and market their skills and abilities to employers. Once employment is secured, we provide one-on-one training to help them learn their job. Project SEARCH offers clients the opportunity to develop valuable and transferable work skills through an internship training program hosted by a large employer. Currently, EBI operates two year-long Project SEARCH programs, one in hospitality and one in office administration. Community Day Supports is a community based day service operating in the Berkeley area where individuals with developmental disabilities and higher support needs receive individualized support to participate in variety of activities. Our staff support individuals to participate in activities such as adaptive communication instruction, physical therapies, independent living skills instruction, art classes, movement/dance classes and fitness activities. 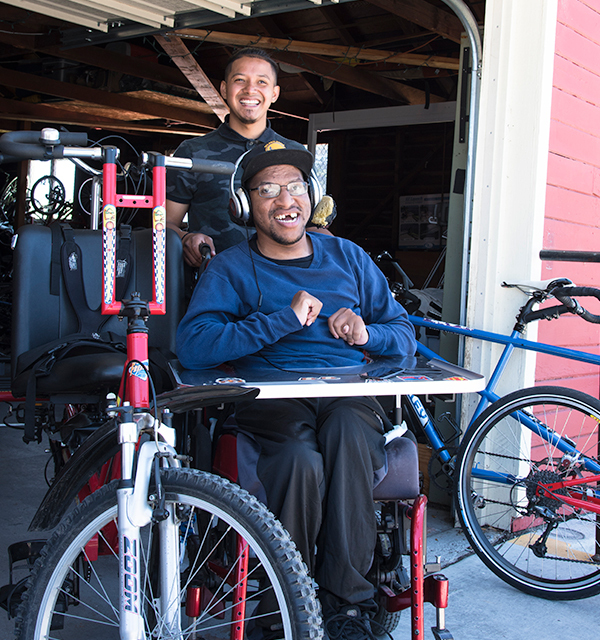 California Community Transitions makes it possible for people with disabilities who receive Medi-Cal to transition from nursing facilities back into their own homes. Our staff provide case management, search for affordable housing, assist clients access the In-Home Supportive Services program, assist in training personal attendants, and identify needed healthcare professionals in the community. People considered to have a developmental disability by the State of California may be eligible for EBI’s Supported Living, Independent Living, Supported Employment Services, and/or Community Day Supports. To establish eligibility, call the Regional Center of the East Bay for more information. If you are already a client of the Regional Center, you can request that your case manager contact EBI to make a referral. To be referred to California Community Transitions (CCT), your nursing facility should contact the CCT team. How can I find an affordable place to live? What is the Regional Center and what services do they provide? How do I find other agencies that provide similar services to East Bay Innovations in the East Bay? Ask your regional center case manager for a list of service providers in your area. If you wish, you can request that your regional center case manager help you to contact potential service provider agencies and set up a time to meet with them so you can ask questions and make an informed choice. Does getting a job and making more money affect my SSI (Supplemental Security Income)? What is the Department of Rehabilitation? Department of Rehabilitation (DOR) is a State agency that assists people with disabilities to become employed. DOR serves people of all disabilities not just developmental disabilities. DOR does provide the initial funding for Employment Services. Employment Services assist people with developmental disabilities to find employment and then, agencies like EBI provide a job coach to help the person to learn the job and be successful. To receive employment services from EBI you must become a client of the Department of Rehabilitation. EBI can help you connect with DOR. How do I receive services from East Bay Innovations? Please be aware that some of EBI’s services may be unable to serve new people at this time. If this is the case you may ask the Program Director if you can be placed on a waiting list. If the program is taking new referrals, then you should call your regional center case manager to ask them to make a formal referral for you to East Bay Innovations.